This 18’ Single Lane Water Slide will provide tons of fun for you and your guests. This slide features our no jump safety netting at the top, sure to keep your guests safe and give peace of mind. 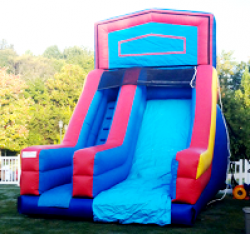 The 18’ Single Water Lane Slide can be used both wet and dry, so you can rent it for your backyard party, school carnival or company picnic! Client will need to provide: 1 Dedicated 15 AMP Power Outlet per blower within 75’ of Equipment Setup Location. Heavy Unit- A minimum of 42″ wide gate is needed to access set up location. Portable Generator is NOT INCLUDED with any inflatable rental. An electrical outlet will be needed to power any inflatable rented. A Portable Generator can be rented through Charlotte Party Rentals should there will be no power source accessible on the setup area (Call us for some pricing). You do also need to provide us a water supply within 75 feet of setup location with pipe ready to be connected to our Garden Hose.